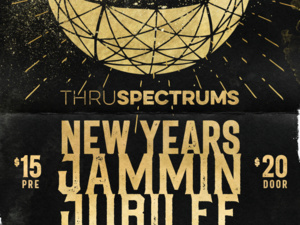 Make your plans now to ring in the new year with Ithaca’s hottest funk-rock crew, Thru Spectrums! This seven piece band is full of energy and will have your feet moving all night long. The ticket includes a complimentary midnight champagne toast for guests. Attendee must be 21 or older. Agava is open for dinner reservations starting at 4pm, with doors for the show opening at 9pm. Offering a wide variety of southwest inspired farm fresh dishes, full margarita bar and a wide selection of craft brews on tap. Gather up your besties to bring in 2019 at Agava on New Year’s Eve! Make your reservations today by calling 607-319-4366 or at agavarestaurant.com/reservations Tables are filling in quickly so call today to reserve yours! This “Love New Year’s Package" contains 2 tickets to New Year’s Eve with Thru Spectrums, a $50 Agava gift card, and a one night stay for 2 within walking distance to the restaurant, all for less than $200. For details and pricing, contact the Best Western University Inn directly at 607-272-6100. Stay up to date about show details and menu options by visiting Agava or Thru Spectrums on Facebook and joining the event.